Cat Bells, Dale Head, Fleetwith Pike, Pillar, Scafell Pike, Illgill Head, Whit Fell and Black Combe. It’s a distinguished roll call of Lakeland tops. And over a windswept weekend in autumn, I didn’t climb any of them. It wasn’t exactly planned that way. I had tried to design a route that included some bits I hadn’t visited: the Newlands valley for one, then Mosedale and Wasdale Head. Then there was Ennerdale, and I had only passed through Eskdale on the miniature railway. Devoke Water, recently featured in a walking magazine, also looked enticing. A rough outline started to take shape. But while the Lake District has a commendable bus network, these western valleys are tricky to reach by bus. Trains along the Cumbrian Coast Line serve the National Park’s outer settlements, but it’s a long walk in to the hills each day. There was only one solution: a walk through the entire Western Fells, from north to south. And so, on a cold Friday morning, I found myself in Keswick, fuelling up on beans and eggs before the expedition. I made my way via Portinscale to the first peak, Cat Bells. 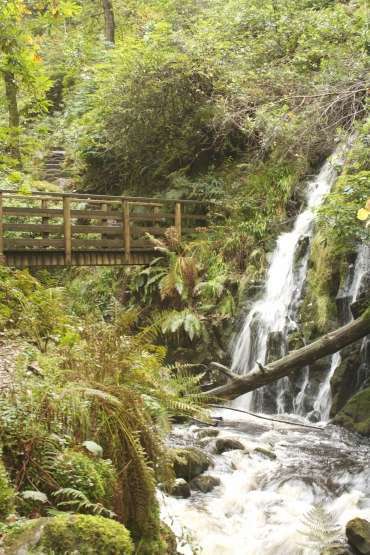 Eschewing the heavily managed path up this popular nubbin – the weight of a three-day backpack had forced the decision to ignore the summits – I took the path into the Newlands valley. Despite the greyness of this autumn day, the bridleway heading to the hamlet of Little Town had a steady stream of hikers. My thoughts are not particularly deep or inspiring, but I had envisaged a little time alone with them. Nodding cheerfully to passers-by, while secretly resenting their presence, I paused under the pretence of admiring Keskadale, but actually in the hope of shaking the others off. The situation was even more alarming as I popped out over Dalehead Crags. Slap-bang in the middle of the popular Newlands Round, it felt like being in the middle of a Lord of the Rings battle scene. Brightly coloured hordes charged down from High Spy to the east, and from Dale Head to the west. I hobbited away to find sanctuary. Mere metres away, Dalehead Tarn was deserted. The dedication of walkers to their guidebook paths remains a mystery to me, but I was grateful for it as I chewed my flapjack in silence. The day continued by passing through the day-trippers at Honister Slate Mine, then more Wainwright enthusiasts scrabbling their way over Haystacks. Pillar brooded angrily as I trudged across Ennerdale and up Black Sail Pass, daring anyone to tackle its slopes and grooves. 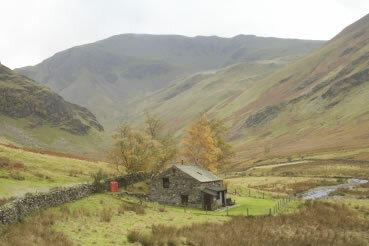 But in Mosedale, I was rewarded with that most treasured experience – a vast valley all to myself. 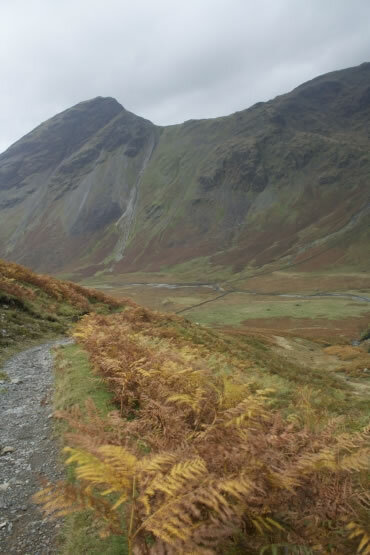 The gold and russet of the autumn bracken (or orange and brown, if you prefer your adjectives devoid of pretentiousness) blended into the grey crags of Steeple and Red Pike. The darkening skies above signalled a fierce storm settling in, and the first drops of rain hurried me down to the valley floor. The campsite is a mercifully short distance to the much-loved Wasdale Head Inn, and that evening I ticked another Lake District classic off my list. The traffic started arriving far too early on Saturday morning. This is an almost weekly event now: minibuses and cars fly down past Wast Water to drop off branded-fleece-clad groups at the start of the path up to Scafell Pike. The pros and cons of the increased numbers tackling the Three Peaks challenge have been well documented elsewhere; for better or worse, I left them behind at Brackenclose. 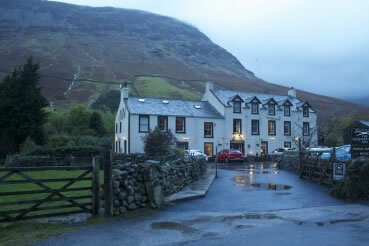 As the string of fluorescent dots edged up Lingmell Gill, I headed south past Illgill Head. 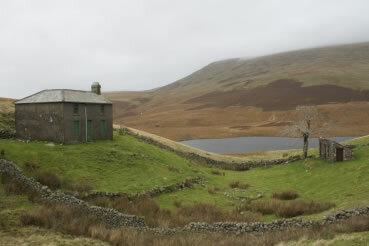 For those who complain that the Lake District is too crowded, then places such as Burnmoor Tarn are a counter argument. 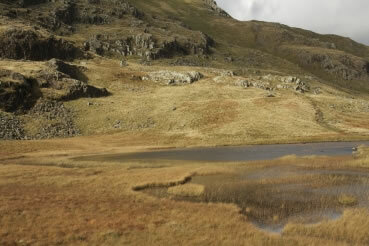 A mere 3km from the summit of Scafell Pike, I was again on my tod at this serene upland tarn. The only problem was that it was only 10.30 and already one third of the day’s ground had been covered. I needed to extend the day a little to avoid reaching camp too early. Ever heard of Miterdale? Nor had I until I perused my map beside the tarn, looking for a longer route into Eskdale. This side valley looked as good a diversion as any, and so it proved, with a rewarding streamside walk into its more celebrated neighbour. The conifer plantations are being cleared too, to allow the natural woodland to regenerate, suggesting it will be even more attractive in the future. After passing into Eskdale and out via Stanley Force waterfall, I reached the squishy ground of Birker Fell. Ominous dark clouds loomed above: the previous night’s storm had been a mere starter and the main course was on its way. I quickly adjusted plans to camp at Devoke Water – no doubt a sumptuous spot, but perhaps not in a gale – and instead headed into Dunnerdale. Along the road, I fell into the trap that catches every walker in time: assuming the OS map was wrong. There was no campsite marked, but in a busy Lake District valley, there was bound to be one somewhere. Even the best mapping companies must make the odd mistake, I thought … maybe they forgot to add it in … or, errrm …. By the time I had reached Crosbythwaite, with no hint of a campsite,I was scanning the horizon for potential wild camping spots. But once again the Lakes came up trumps. The owners at Hazel Head Farm have converted one of the barns into a walkers’ barn, complete with toilets, hot drinks and homemade cakes. Strangely there is no campsite, despite the gap in the market, but the farmer was happy for me to share a field with three of his ewes. They took great interest in my dried mango from Waitrose – clearly a middle-class breed. 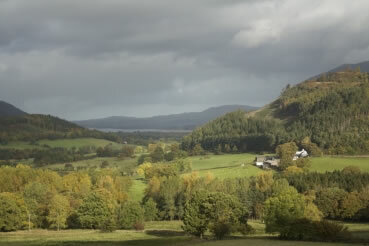 As I brewed up in the barn, the storm crashed over nearby Hesk Fell. My decision to avoid the tops on this trip had paid off once again. 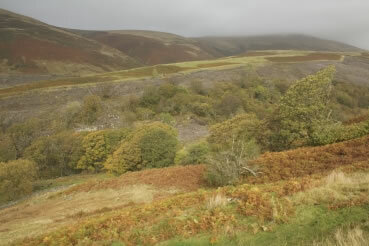 The route continued over Whit Fell and Black Combe, which we have blogged about before.